This quick start tutorial demonstrates how to create a simple iOS application with TKAlert. alert.title = "Chicken or the egg?" 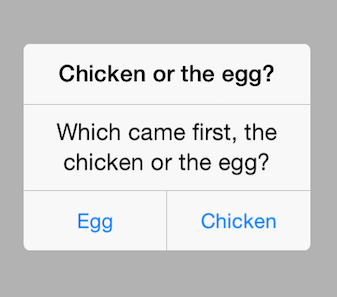 alert.message = "Which came first, the chicken or the egg?" self.textLabel.text = "It was the egg"
self.textLabel.text = "It was the chiken"